For the daily dependability and efficient, technologically-advanced performance, there's an RTV model to meet your exact needs. GASOLINE ENGINE: The gasoline engine features an Electronic Fuel Injection (EFI) system that provides on-demand power, optimizes acceleration and enhances quiet operability. Plus, the EFI eliminates the need to adjust the carburetor, enabling better engine start-up in cold weather or after long-term storage and improving engine serviceability. DUMPING CARGO BED: Use the cargo bed to haul up to 441 lb. of dirt, gravel, rocks, hay or whatever will fit. The bed also manually tilts up to make dumping or unloading your cargo easy. CONVENIENT TRANSPORTATION: The RTV400 and RTV500 are 54.7 in. width; both are designed to fit into a full-size, long-bed pickup truck for easy loading and transporting. COMFORTABLE OPERATOR AREA: Get in and get going. 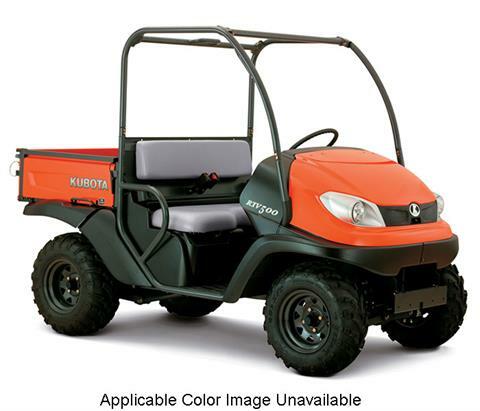 Featuring ergonomic, well-placed controls for easy operation and a comfortable contoured bench seat, so both the driver and passenger can enjoy a full day of work or play. The low operator platform offers ample and obstacle-free leg room, so it’s simple to step on or off. Standard ROPS meets or exceeds applicable SAE and OSHA requirements.